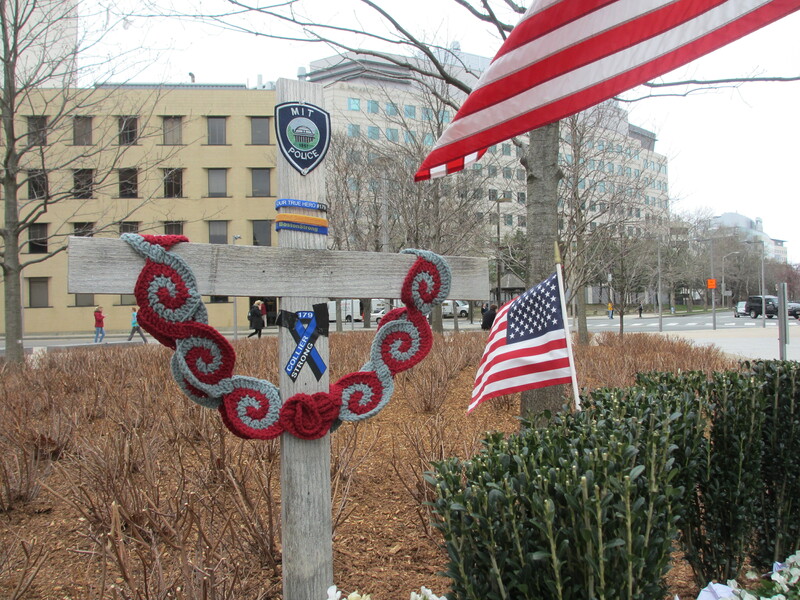 Today was the one year anniversary of Officer Sean Collier‘s death. I visited his temporary memorial, which I had recently learned was made from a piece of the Great Dome, MIT’s most iconic building. It seemed fitting for someone who loved MIT students so much. The stone marker will eventually be replaced with a permanent memorial. I didn’t have the honor of knowing Sean, but his story really resonated with me because of his love of MIT students. I went to work at MIT because I fell in love with the student culture when my friends were attending MIT as undergrads. 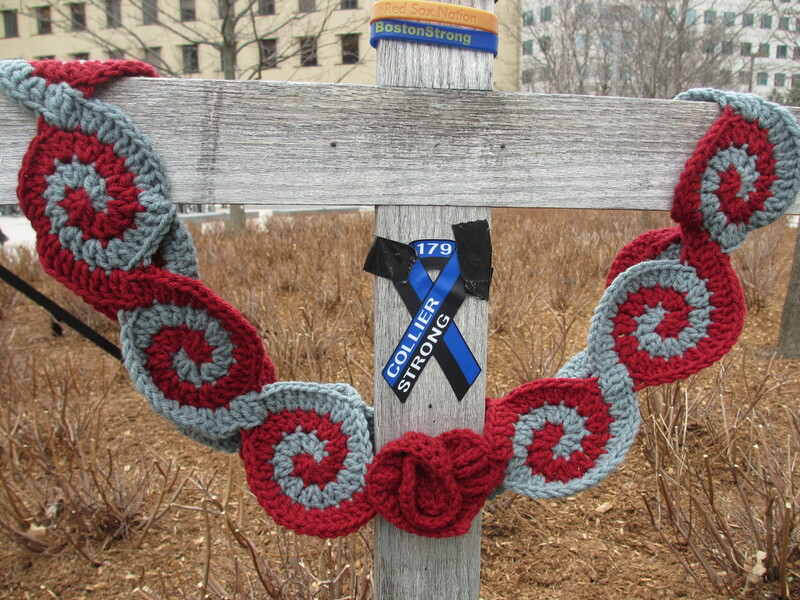 Last year I crocheted a little star while watching the webcast of Sean’s memorial service at MIT. This year I knew I wanted to make something bigger, but I didn’t figure out what until I saw the response to my S Scroll Marathon Scarf. 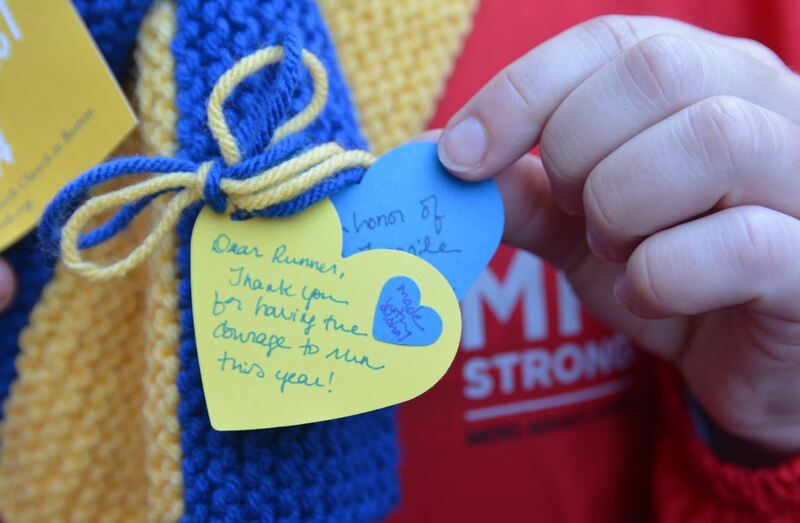 So many people at the marathon scarf Knit In were excited about it. I guess the design spoke to them. I crocheted the same scarf in MIT red and gray (which were surprisingly hard to match) and decided it would be an infinity scarf to make it easier to hang on the cross. The scarf is 100% acrylic to stand up to the weather and made from Caron One Pound in Claret and vintage Red Heart worsted in Gray. When I was sewing all the motifs together I decided it didn’t feel emotional enough so I searched Ravelry for a spiral heart pattern and found this. I needed the heart to be much larger so I modified the pattern and managed to get it close to the size of the swirl motifs. I don’t usually give my project special names – I either give them descriptive names or stick with the name of the pattern. 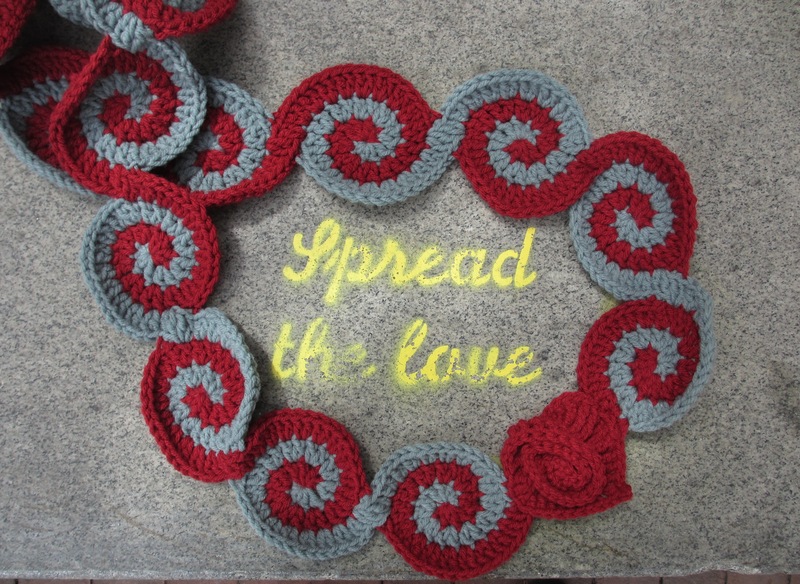 When I was thinking about what to enter into the name field on Ravelry I decided that since it was an infinity scarf I would name it Infinite Collier, a play on Infinite Corridor, the main pedestrian thoroughfare that runs through five of MIT’s main buildings. 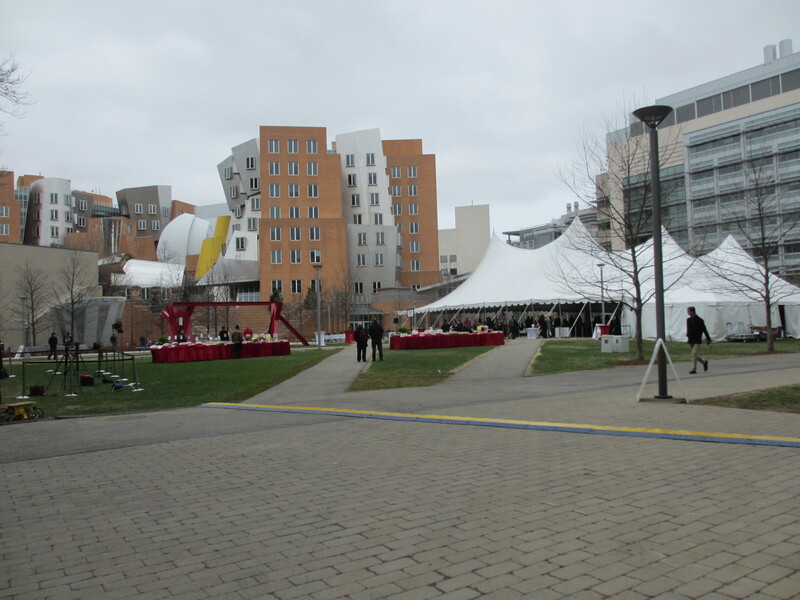 After that I was passing by the community picnic/rally for the MIT Strong team. The team comprises 39 people with MIT affiliations: students, staff, former staff, faculty, and alumni who are running in Sean’s memory and to raise money for the Sean A. Collier Memorial Fund which is used to fund the Collier Medal and other efforts to remember Sean. I spotted a marathon scarf in the wild on team member Mike Gerhardt (his was made by Sharon from Sherborn, MA), pictured here with Sarah Lewis. 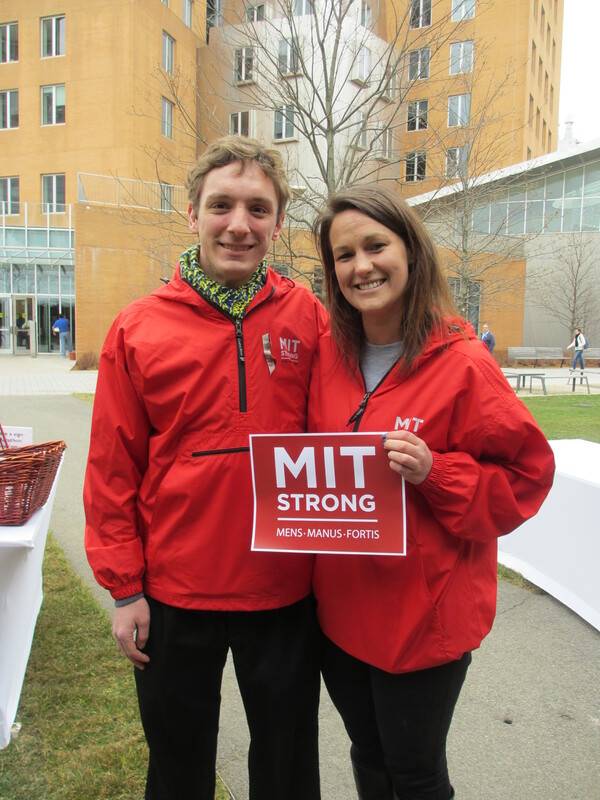 (4/20/14: Just found more of the MIT Strong team with scarves in a random person’s Twitter feed when I was looking through #marathonscarves. They were also on WCVB.) 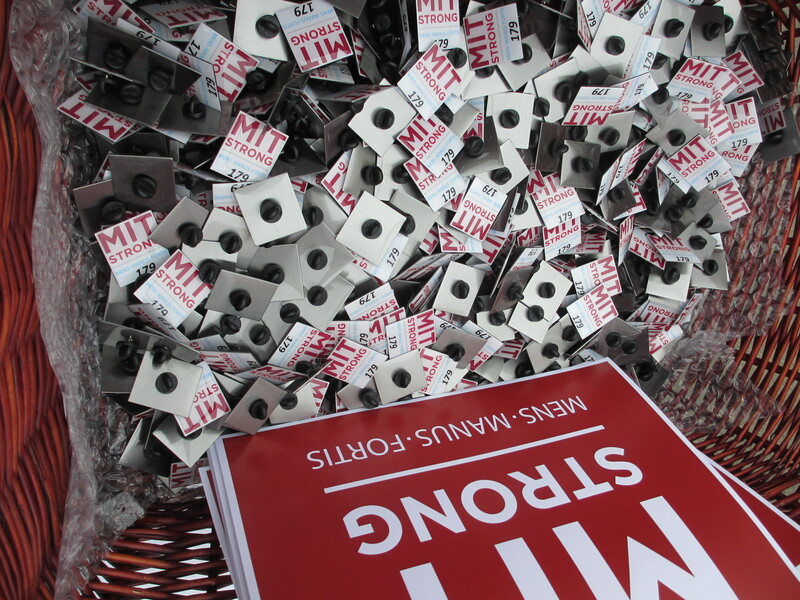 There were baskets of MIT Strong pins and signs for people to wear/bring to the marathon on Monday. They say “Mens Manus Fortis” from MIT’s motto “Mens et Manus” which means “mind and hand” and “Fortis” which means “strong”. 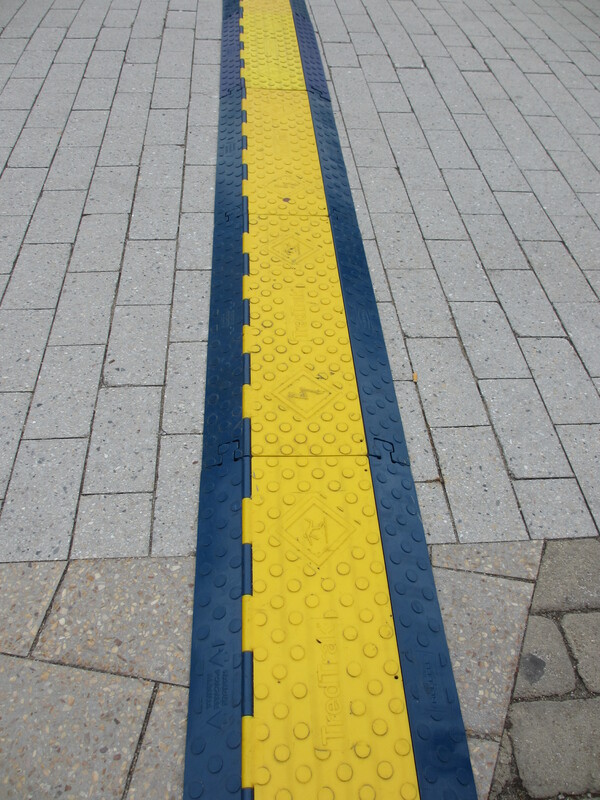 As I was walking away I noticed the cable covers were marathon blue and yellow! This was not my first interaction with the team. In a bit of kismet, the first scarf I donated to the Marathon Scarf Project went to team member Stephanie Kloos! I was so excited to hear from her on Monday. She and other team members received scarves at the Sports Illustrated shoot last Saturday. More pics here and on Ravelry. 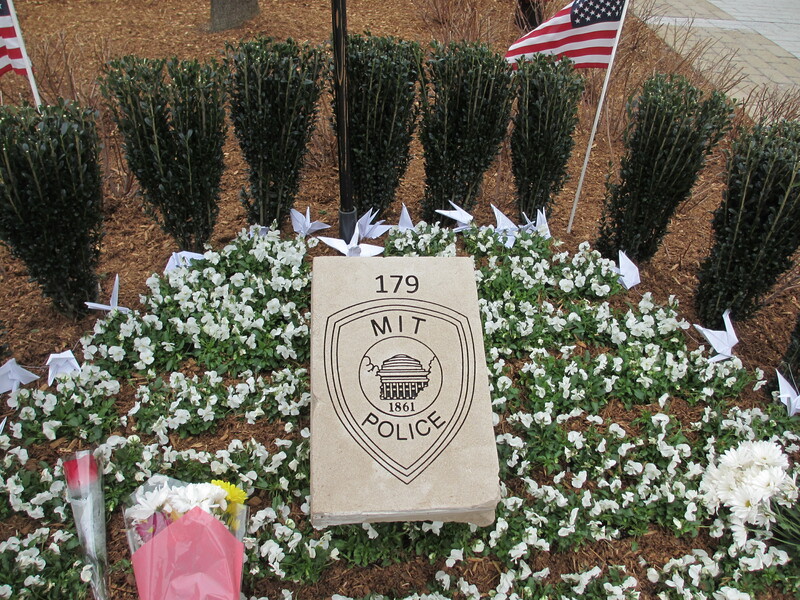 This year’s ceremony of remembrance is available here.